US Senator and former presidential primaries candidate Marco Rubio accused Secretary of State John Kerry of undermining America's moral standing in the world following Kerry's speech in which he blasted Israel's construction in Jewish neighborhoods in Judea, Samaria, and eastern Jerusalem. Rubio released a statement saying: "Secretary Kerry today once again decided to cater to the demands of freedom’s enemies and devote an entire speech to disparaging a country that is one of our closest allies. This administration’s shameful undermining of our moral standing in the world should be a warning to administrations for decades to come about the consequences of America abandoning our values. When we fail to take a stand against those that seek to deny Israel’s right to exist or try to question the Jewish history of Jerusalem, we hurt not just Israel but our own credibility." The statement continued: "The greatest immediate threat to the future of Israel is not a stalled peace process, or settlements, but the abandonment of the Jewish state by the current U.S. administration at a time when it needs America’s support more than ever." 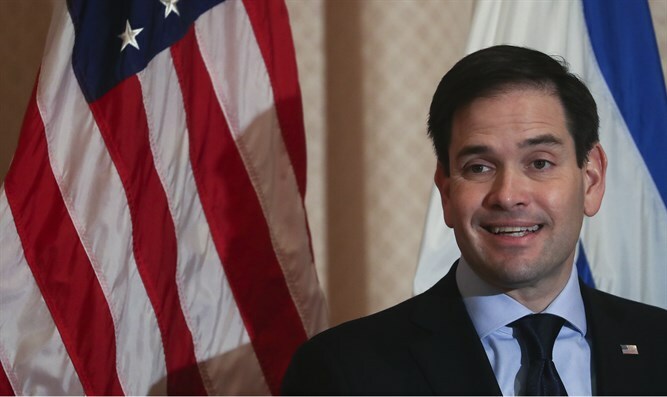 Rubio expressed the hope that President-elect Donald Trump would take a different approach to America's relationship with Israel than President Obama and Secretary of State Kerry. "I look forward to working with President-elect Trump and his incoming team to restore our relationship with Israel to its proper place. I intend to continue to work with my colleagues to fight alarming efforts by those in the United States and internationally to promote modern day anti-Semitism through the boycott and divestment movement. I will also work to ensure that if the United Nations wants to continue to promote anti-Semitism and anti-Israel views, it will do so without U.S. taxpayer funding." "This shameful episode in American foreign policy cannot end soon enough." Rubio condluded.